It's all happening again after the summer. This year, MoOD+Indigo will be opening its doors for the 10th time, so this will definitely be a party edition! The international trade show gathering producers of upholstery, window & wall coverings for the residential and contract market, and surface and pattern designers bringing a European collection will be taking place at the usual location – Tour & Taxis, Brussels – on the usual days from Tuesday, 11 September until Thursday, 13 September. Only Indigo has slightly different opening hours and will open doors on Monday afternoon for an exclusive pre-opening on 10 September at 1 p.m.
For this 10th edition of MoOD+Indigo, the organisation set-up an exclusive night with keynote speaker Daan Roosegaarde, including nice food and drinks on Tuesday, 11 September. Dutch artist and innovator Daan Roosegaarde presents ‘Landscapes of the Future', highlighting his innovative practice which merges people, technology and space to create a better world. Virtual floods, smart highways and smog sucking towers; Roosegaarde pulls technology out of the screens to examine and activate solutions to improve daily life in urban environments. 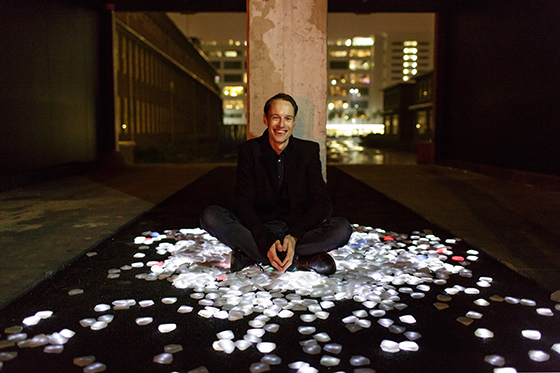 In his interactive talk, Roosegaarde explores the social role of design, the importance of “Schoonheid” – a Dutch word meaning both beauty and cleanliness – along with his vision for the future. As the new ‘hippie with a business plan', to quote the New York Times, Roosegaarde has been selected as a creative change maker by Forbes and Good 100 and is a young global leader of the World Economic Forum. After the talk participants can enjoy drinks at the reception. The perfect time for a casual chat at the end of the first show day. This is an exclusive event with a limited number of seats. Do not wait to make your online reservation! This event is free for MoOD+INDIGO visitors. To attend this event you must have an entrance ticket for MoOD+Indigo. Don't have a ticket for MoOD+Indigo yet?